"Copper=engraving uncolored map of Lazio region, Italy's central-west coast with the city of Rome. Relief shown pictorially. 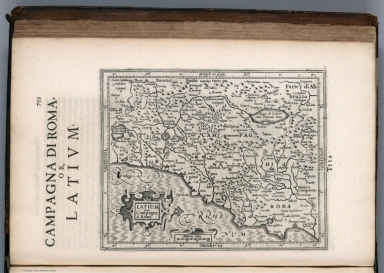 Second edition in English, translated from the Mercator Hondius 1607 Atlas Minor (see our copy 11201.000) by Wye Saltonstall. With engraved decorative title page dated 1637 that is filled with allegorical female figures, geographers measuring the globe within an architectural surrounding, and additional title page from the first edition, dated 1635, with the imprint: Printed by T. Cotes for Michael Sparke and Samuel Cartwright. The atlas is in 1032 pages, includes frontispiece ""Englished by W.S.,"" dedications signed by Wye Saltonstall. Also includes preface, notes, 26 pages of tables, index, illustrations, diagrams, portrait, 930 pages of text and 184 maps. In full leather binding with raised spine. Maps with decorative cartouches, showing the boundaries, territories, topographical features, cities and towns, landmarks, rivers, forests, some maps with illustrations of sea monsters and sailing ships. Relief shown pictorially. Numerous errors in pagination. P. 905 bears a map of New Spain, a duplicate of that on p. 907, description of New Spaine read New Virginia, but there is no Map of Virginia. There is map of Virginia and Florida, which covers the area south of Chesapeake Bay, used first in the ""Atlas Minor"" of 1607. The map of Egypt: 'At Page 818. the single Map of Aegypt is to be pasted on the Page. Second printing in English, with a duplicate map of New Spain in place of the later issued map of Virginia by Ralph Hall: ""there is no Map for Virginia in regard there is a more exact Map drawing in that Country, whose Platforme is not yet come over, but when it comes, every buyer of the Booke shall have it given him gratis"" (see errata on verso of final leaf). ""Wye Saltonstall intended in his first edition of the ""Historia Mundi"" a map of Virginia. In acquiring the Mercator-Hondius copperplates used first in the ""Atlas Minor"" of 1607, he only possessed one of Virginia and Florida, which covers the area south of Chesapeake Bay. Since that time the Jamestown colony had become important, and a map would be needed to illustrate it… [Hall's] map was included in future editions of the ""Historia Mundi"" in 1637 and 1639"" (Burden 244). Without the ninth state of the rare map of New England by John Smith found in some copies. This edition, with the first edition printed title page and the second edition decorative title, is a mixed edition and does not yet include the later added Hall map of Virginia."